I’ve been writing to you over the last couple of years about the Mt Auburn Street Corridor Study. Some of you may have participated personally in the extensive discussions about how to make the corridor safer and more functional for users and vehicles of all kinds. As you may recall, one of the recommendations that came out of the study was to create a priority lane on certain sections of Mt Auburn Street for the 71 and 73 buses, which carry over half the number of people moving through the corridor during the morning rush hour. 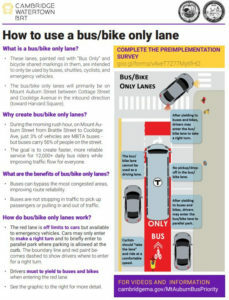 For the last several months, Cambridge, Watertown, the MBTA and DCR have been making preparations to implement a pilot of the bus priority lane. If you live or work in the area, you may have received flyers or other information about the pilot and if you travel the corridor, you have probably seen the road restriping and work to install new signal equipment. My office participated in a conference call this morning that confirmed that the preparations will soon be complete, meaning that the Mt Auburn Street Bus Priority Pilot will officially begin this coming Monday, October 22. There will be a dedicated travel lane (painted red) on Mt Auburn Street for buses, bicycles, shuttles and emergency vehicles starting at Cottage Street in Watertown and continuing on much of Mt Auburn Street to Fresh Pond Parkway in Cambridge. During the morning rush hour (7:00-9:00am), the parking lane on Mt Auburn Street inbound near School Street and Walnut Street in Watertown will be used for buses and right-turning cars. This will help buses proceed through these intersections more quickly and allow drivers to turn right without waiting for the light to turn green. There will be re-timed traffic signals so that inbound traffic will get more green light time, particularly at Fresh Pond Parkway. There will also be priority signals for the buses to allow them to “queue jump” at key intersections. The bus stops at Aberdeen Ave (both inbound and outbound) will be temporarily removed as part of the pilot. Passengers transferring to or from the 72 bus will now need to change at Brattle St (inbound) and Homer Ave (outbound). The first week of the pilot will be a “soft launch.” The two municipalities, the MBTA and DCR will be carefully monitoring the traffic and making adjustments as needed. Likewise, over the course of the pilot they will continually evaluate and adjust the design to inform long-term planning for the corridor. I hope you will share your feedback with me or directly with them.